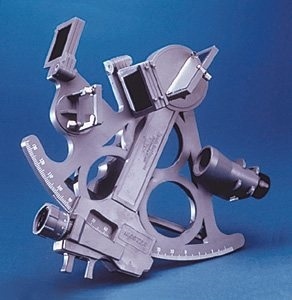 DELUXE MARK 25 MASTER SEXTANT with full-field dielectric Beam Converger Foam-lined carrying case included Full-field Beam Converger with quartz hardcoat replaces conventional half-silvered mirror. Horizon and astrobody images are combined in a single full-field for easy, reliable sights under the most difficult conditions. Special mineral coating is selective for different wavelengths of light. Horizon is transmitted in one color region and the star or sun in another. Improved reinforced plastic stiffens frame for greater measurement accuracy. High-efficiency LED (solid-state Light Emitting Diode) illumination system, which floods arc and drum with soft light. The LED will last for the lifetime* of the sextant. Batteries, which are included, will last up to 10 times longer than with regular bulbs. This is another Davis first! Positive "push-on" switching action, with vinyl boot water protection. This item is available to order within 5-7 business days.